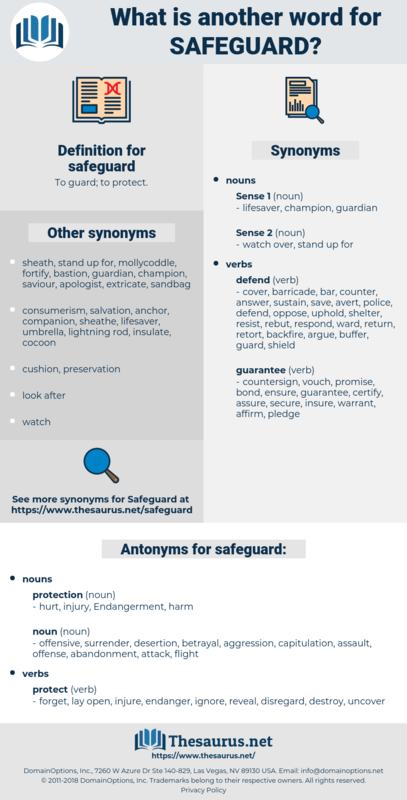 What is another word for safeguard? ensured, assured, ensure, saving, ensuring. regards, interests, Guaranteeing, preserving, ensure, saving, ensuring. considerations, guarantors, precautions, clauses, protectors, perimeters, benefits, supports, backups, Necessities, allowances, guys, schemes, interests. 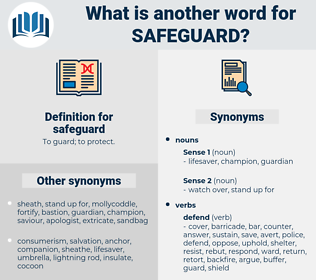 precaution, Guaranteeing, preserving, ensure, saving, ensuring, bulwark. ensures, steps, retain, salvage, insure, reassure, assert, insulate, enshrine, enforce, ensure, saving, vindicate, consolidate, nurture, promote. offensive, surrender, desertion, betrayal, aggression, capitulation, assault, offense, abandonment, attack, flight. forget, lay open, injure, endanger, ignore, reveal, disregard, destroy, uncover. In safeguarding women in general, men safeguard their own individual women, of course.
" Coolness is our safeguard," says the captain.